One thing that has been brought up over an over in classes I have taken on Islamic extremism is that you should not enter int a truce or cease fire unless you are in a position of weakness. 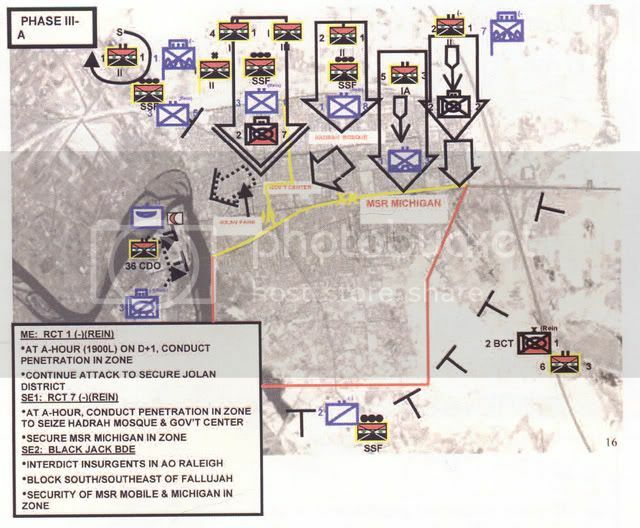 The US's cease fire in Fallujah in April 2004 is always used as a case in point. The US was in a position of power and could have crushed the insurgency. However, pressure from the Iraqi government, the US State Department and world wide public opinion, due to insurgents claims that US Marines were killing women and children (images being broadcast by Al Jazera) let to the US agreeing to a cease fire. This cease fire allowed the insurgents to regroup, resupply, dig in and become stronger. General Mattis was in charge during the first battle of Fallujah. General Natonski took over that August and led the second attack. The book No True Glory by Bing West describes in detail Operations Vigilant Resolve and Phantom Fury (Al Fajr or "Dawn" by the Iraqis). Have you ever wanted to ask a General who was involved in an event, which is already considered a 'historic" touch stone battle for the Marines, "Would you do it the same way?" My question, which by the time the Q&A portion of the evening did not come out as articulate as how I am going to write it, heck I could barely get all the words completed, but we can thank my day at work for that. General Natonski, based on your experience would you recommend doing the same thing in a similar situation in the future? I've taken courses on Islamic extremism and the Koran says not to enter into a truce or cease fire unless you are in a position of weakness so that you can rebuild your strength. Fallujah is used as a text book example of what not to do when dealing with extremists. Would you do it this way again? To summarize, the answer was "No." Natonski said Mattis didn't want the cease fire, ( a lot of "Ooorahs!" from the crowd) but they were pressured to do so because the press was showing footage of dead women and children and blaming the deaths on the Marines. The good thing about the cease fire, it allowed the non-combatants to leave the city. Natonski said when they did the second attack in November 2004, they were given the green light, by Bush, to get the job done, no cease fires. And get the job done they did. It wasn't easy. The insurgents had dug in. 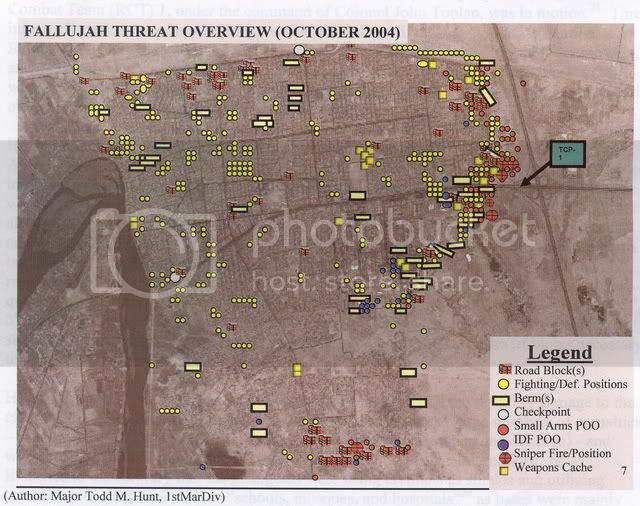 They showed us an intel threat overview map of Fallujah from October 2004. The highest concentration of insurgent positions were on the eastern side of the city, the area toward Baghdad. That is the direction the insurgents expected the US offensive to come from. As you can see from the illustration below, the US attacked from the north. 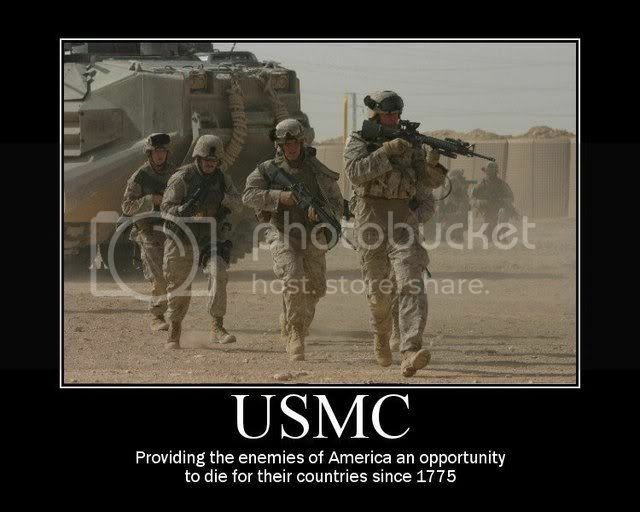 And it wasn't just a US Marine Corps attack. While the Marine Corps leadership was in charge, Marine units were integrated with the US Navy Seals, Army Cav, the British Blackjack Brigade, and Iraqi Army units. During the first 22 days of the battle, Explosive Ordnance Disposal uncovered and disarmed over 11,000 IEDs - - yes, that is 11,000 IEDs. In one of the aerial attacks of the city, US forces bombed a Command and Control center. After the initial explosion which destroyed the building there were a series of secondary explosions including one that traveled several hundred yards down the road leading to the building. The insurgents had set-up IEDs in a daisy chain, expecting US forces to head down that road to the building, the plan, wait until the troops were on that section of road and them blow them all up. This next illustration shows you what was found. 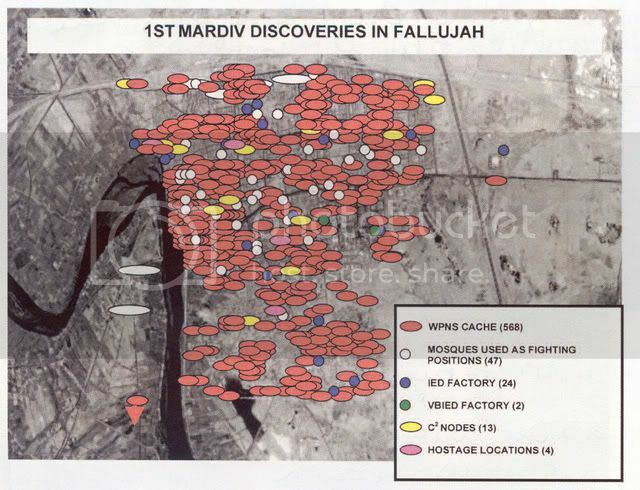 One of the things that General Natonski noted was that Fallujah was known as the city of Mosques. He commented that there were a few less Mosques at the end of the battle. Why, when they were suppose to be off limits - - well, Insurgents used at least 47 mosques as fighting positions. The tall minarets are perfect sniper or look out positions. If Marines were taking fire from a Mosque, they took it out. It was neat to listen to and get the chance to ask a General involved with the battle a question. It was also a bit intimidating to be surrounded by a bunch of Marines who had been there. It was almost like attending one of the first Combat Veterans of Fallujah Symposiums, like that of the Combat Veterans of Iwo Jima. There was a smattering of wives at the event. Total, about 100 people (that is all the museum can fit in the mess hall and theater at this time - - looking forward to that 400 seat theater in phase 2!) So, yes, this was another event were there was a line to the men's room but not to the ladies' room. I think it is a good thing for the spouses to come to these events. I think for them, it is a good thing to gain a better understanding of what their spouses went through. It is definitely more personal for them. For me, I gained a much better understanding of the battle and picked up some more stories to tell on tours. All in all, a great evening. I would highly recommend attending one of these events at the museum.